If you feel terrible about the impact your child’s disposable nappies are having on landfill (yet can’t quite manage the switch to cloth), then listen up! 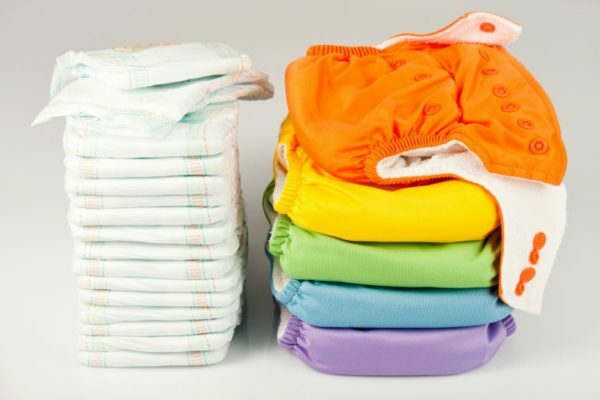 Here are eight things you can do to ‘up the eco’ when it comes to using throwaway nappies. I know this sounds gross, but it’s actually pretty important. When you put a super soiled nappy in the bin and it goes to landfill, the trapped number two breaks down and creates a huge amount of poisonous methane gas. Poo belongs in the toilet where it can be flushed away and treated properly. 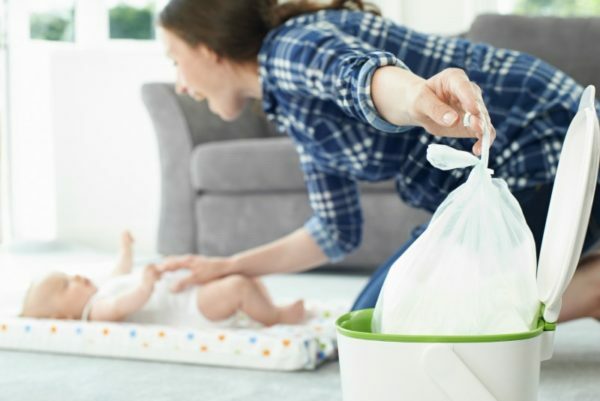 So although it’s a bit hard in the newborn days or when your child has the runs, if there is a solid poo there, scrape it into the toilet, flush, and THEN put the rolled up nappy in the bin. Using plastic nappy bags for hygiene reasons is tempting. However, think about that trapped poo in the nappy inside a little plastic bag inside ANOTHER plastic bag. Not cool. If you are scraping the poo out before you throw out the nappy, then this will eliminate most of the bad smells anyway, and if it’s just a number one, well it’s no big deal right? In situations where you have to use a bag though (such as if you’re nowhere near a toilet or the poo isn’t solid), then be sure to use biodegradable nappy bags. If your child’s nappy appears dry when you go to change her or take it off for bath-time, then use your common sense and reuse it. Of course, a child should never be left for too long in a full, wet or soiled nappy as it can cause a nappy rash or other things like a UTI. However, if it’s not wet then don’t waste it. The best kind of swimming nappy you can put your bub in is actually a pair of proper swimming pants that you wash. However, if you are using the disposable kind, unless there’s been a poo accident, just rinse and reuse them after each use. Each pair should last at least ten or more wears, or until they start to lose shape and pack it in. Not all nappies are created equal. While the cheaper brands will save you money and the fancy ones might promise all kinds of things, it’s best to opt for eco nappies which are made from environmentally friendly materials such as bamboo, which break down more easily in landfill. You want to buy eco wipes too which are not only biodegradable but safer than harsh chemicals on your baby’s sensitive skin. If you want to use cloth nappies but can’t face doing it full-time, then consider doing a combination of both. Perhaps cloth nappies for when you’re at home during the day, and disposables for when you’re out and about, while travelling and bedtime. Every disposable nappy that you don’t use is a win, so think about mixing it up. There are some great reusable cloth nappies out there now which are really easy to use – no more white pieces of terry towelling with safety pins! Cloth and disposable nappies aren’t the only options for children who aren’t yet toilet trained. There’s a method called Elimination Communication where you can actually teach your baby to poo or wee on cue with you holding them over the toilet (yes it’s true!). And then there are also clever inventions such as pyjamas which hold wee accidents, which are perfect for when you’re toilet training, or you have a bed wetter. In summer there’s nothing wrong with letting your little one toddle around the garden naked either. We get it; toilet training can be a real hassle, especially if you have other children and your hands full. However, if your child is old enough and showing a keen interest in using the toilet, then stop being lazy and get her into some pants – stat. If she’s ready, the training won’t take too long either. Think of all the nappies you won’t have to buy and ultimately put in landfill! Do you feel guilty about using disposable nappies? What tips do you have for reducing their impact on the environment? Share your ideas with us on Facebook!